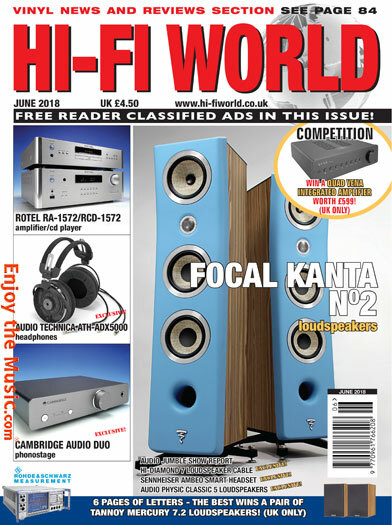 Hi-Fi World is an independently owned and run specialist hi-fi magazine, started by Noel Keywood, a highly respected technical journalist of thirty five years standing. Dedicated to equipment of all types, the emphasis is on 'affordable audiophile' kit which doesn't have to be expensive, but has to perform. Our readership is worldwide and diverse in nature, but all share a passion for music and the desire to hear it as enjoyably as possible. Run by enthusiasts for enthusiasts, our commitment shows in everything from the rigorous technical measurements we undertake on almost every product reviewed to the weird and wonderful editorial mix. 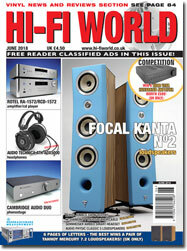 No product is too small or obscure; old and new, budget or high end, if it's great then Hi-Fi World will say so! Your chance to win a Quad Vena amplifier worth �599. Updated guide to the latest and greatest hi-fi hardware on sale. Ensure your copy every month and save money too! Focal's new curvaceous Kanta No2 loudspeakers make a big impression on Jon Myles. Slim yet potent � Germany's entry-level audio physic floortstanders produce a refined sound, says Jon Myles. Noel Keywood tries out audio Technica's latest over-ear headphones. Binaural sound proves a revelation on Sennheiser's new Ambeo headset. Martin pipe explains all. Seriously good loudspeaker cables from Italy's hi-diamond. Jon Myles plugs them in and enjoys. Martin pipe hunts out the bargains at the latest Audiojumble, Tonbridge, Kent. Two ways to improve the sound from your mobile player. Sony's classic D22 Discman gets a thorough review from martin pipe. All the latest and greatest vinyl releases for you, from the pen of Paul Rigby. A classy phonostage from Cambridge audio proves a bargain, says noel Keywood. Paul Rigby on a new book that explains why vinyl is still the medium of choice for music lovers around the world. The team get to grips with matters music, hi-fi and life! Paul Rigby looks back at Brinsley Scwharz's classic nervous on the road album.